A wide range of treatment techniques and approaches from different philisophical backgrounds are utilised in Neurological Rehabilitation. Research to support the different approaches varies hugely, with a wealth of research to support the use of some techniques while other approaches have limited evidence to support its use but rely on ancedotal evidence. This page provides a brief overview of some of the approaches used in Stroke Rehabilitation with evidence based clinical guideline recommendations. While the body of knowledge in relation to physiotherapy in stroke rehabilitation is still growing further confirmation of the evidence for physiotherapy after stroke, and facilitating the transfer to clinical practice, requires a better understanding of the neurophysiological mechanisms, including neuroplasticity, that drive stroke recovery, as well as the impact of physiotherapy interventions on these underlying mechanisms. Similarily further research is required to support physiotherapy implementation strategies in order to optimize the transfer of scientific knowledge into clinical practice. High growth in evidence does in its own way create challenges for physiotherapists in keeping up to date with new evidence as it becomes available and there is a need for further investigation into more effective and efficient methods for physiotherapists to keep their knowledge and skill level up-to-date in the long term. Initial specialist assessment for positioning should occur in acute stroke as soon as possible and where possible within 4 hours of arrival at hospital. Immobility is associated with a number of post stroke complications such as deep vein thrombosis etc. Early mobilization aims to reduce the time that elapses between stroke and the first time the patient leaves the bed, increasing the amount of physical activity that the patient engages in outside of bed. Early mobilisation (e.g. activities such as sitting out of bed, transfers, standing and walking) aims to minimise the risk of the complications of immobility and improve functional recovery. There remains some ongoing discssion about the exact meaning of very early mobilization but Verbeek et al (2014) define early mobilization as ‘mobilizing a patient out of bed within 24 hours after the stroke, and encouraging them to practice outside the bed'  . Recent changes in recommendations have been made as a result of the AVERT Trial RCT of over 2000 individuals with acute stroke, which showed that very early, more frequent, higher dose mobilisation focused on out-of-bed activities in addition to usual care was worse than usual care alone and led to greater disability at three months with no effect on immobility-related complications or walking recovery . The highest priority for many people with limited mobility after stroke is to walk independently. This section focuses on treatments and equipment aimed at improving walking and includes exercise. Individuals post stroke benefit from time spent in task-specific, walking-orientated leg exercises which have a cardiorespiratory focus both early and late after stroke. Interventions should be of a sufficient intensity with a focus on progression, task-specificity and challenge to improve outcomes and can include strengthening exercises for the leg, over-ground walking, circuit classes and treadmill training with and without body weight support . If walking performance is poor after stroke, community activity may be limited and people may become housebound and isolated from society. Electromechanical-assisted gait training, with and without partial body weight support as well as with or without FES, are used as adjuncts to overground gait training for the rehabilitation of patients after stroke and can be used to give non-ambulatory patients intensive practice (in terms of high repetitions) of complex gait cycles. Automated electromechanical gait machines consist either of a robot-driven exoskeleton orthosis or an electromechanical solution with two driven foot-plates simulating the phases of gait aand offer reduced effort for therapists, as they no longer need to set the paretic limbs or assist trunk movements. The main difference between electromechanical-assisted and treadmill training is that the process of gait training is automated and supported by an electromechanical solution. Current research indicates that repetitive gait training in combination with physiotherapy may improve walking ability in patients after stroke. The difficulty level of the training scenarios can be adjusted by varying the speed and slope of the treadmill, the complexity of tasks, and the amount of body weight support and can allow immediate patient feedback on performance, which is an important component of learning. While skilled therapy will always be a part of rehabilitation, the use of VR-enhanced treadmill training may be a cost-effective way to increase patient motivation to practice walking under different simulated conditions. It remains unclear whether virtual reality mobility training is more effective than other interventions for patients with a stroke in terms of comfortable and maximum walking speed, spatiotemporal gait parameters and walking ability. Individualised goals should be set and assistance with adaptive equipment, information, and further referral on to other agencies should be provided for individuals who have difficulty with outdoor mobility in the community. Up to 85% of indviduals post stroke experience altered arm function, with approximately 40% of individuals being affected by upper limb function long term. Loss of arm function adversely affects quality of life, and functional motor recovery in affected upper extremities in patients with hemiplegia is the primary goal of physical therapists. "Currently there is no high quality evidence for any interventions that are routine practice, and evidence is insufficient to enable comparison of the relative effectiveness of interventions.” In other words, the evidence is insufficient to show which of the interventions are the most effective for improving upper limb function” . Bilateral Arm Training provides intensive training of bilateral coordination to enable practice of bimanual skills. During bilateral arm training, movement patterns or activities are performed with both hands simultaneously but independent from each other and can also be cyclic. This approach was developed in response to identified limitations of Constraint Induced Movement Therapy (CIMT) which precludes the opportunity to practice bilateral skills particularly functional activities that are inherently bimanual. Unilateral and bilateral training are similarly effective. However, intervention success may depend on severity of upper limb paresis and time of intervention post-stroke. Original CIMT Applied for 2 to 3 weeks consisting of immobilization of the non-paretic arm with a padded mitt for 90% of waking hours utilising task-oriented training with a high number of repetitions for 6 hours a day; and behavioral strategies to improve both compliance and transfer of the activities practiced from the clinical setting to the patient’s home environment. High-intensity mCIMT Consists of immobilization of the non-paretic arm with a padded mitt for 90% of waking hours with between 3 to 6 hours of task-oriented training a day. Found to be more beneficial in the acute stage pf rehabilitation with less effect on chronic upper limb impairment. Low-intensity mCIMT Consisted of immobilization of the non-paretic arm with a padded mitt for > 0% to < 90% of waking hours with between 0 to 3 hours of task-oriented training a day. Functional Electrical Stimulation appears to moderately improve upper limb activity compared with both no intervention and training alone. Current evidence suggest that electrical stimulation should be used in stroke rehabilitation to improve the ability to perform functional upper limb activities. The evidence base for virtual reality and interactive video gaming-based interventions for the arm (as an adjunct to usual care to increase overall therapy time) is developing, though studies are often of low quality and further research is needed. Motor imagery (MI) is a mental process of rehearsal for a given action in order to improve motor function while Mental Practice (MP) is a training method during which a person cognitively rehearses a physical skill using MI in the absence of overt, physical movements for the purpose of enhancing motor skill performance. Mental practice with motor imagery ‒ the practising of movements and activities ‘in the mind’ ‒ has been advocated to aid recovery following stroke. 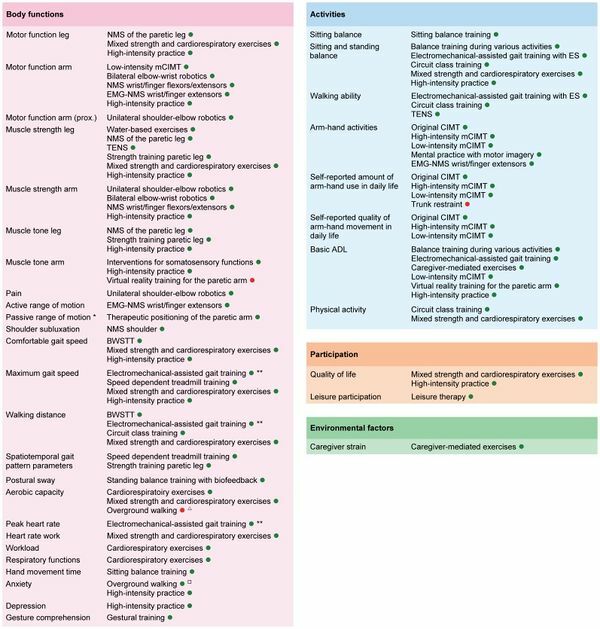 Current Systematic Reviews support the use of mental practice as an adjunct to conventional therapy techniques for arm rehabilitation in the acute, sub-acute and chronic phases of stroke, particulalry in those with more severe impairment of the upper limb. Interestingly, Mental Practice using Motor Imagery increases affected arm use, thus overcoming this movement suppression phenomenon and combined with Physical Practice training was better for the restoration of hand function than Physical Practice alone. There is an increasing range of aerobic exercise options being accessed by people with following Stroke. These range from aerobic exercise programmes (e.g. overground walking or treadmill training programmes) and an array of sporting and exercise classes to the use of technology (e.g. virtual reality training). These options, supported by the growing body of evidence, present the therapist and patient with the ability to select a programme for an individual, which is timely and can be carried out in an appropriate environment. Rehabilitation should include individually tailored exercise interventions to improve cardiorespiratory fitness. Commence cardiorespiratory training during their inpatient stay. Encourage to participate in ongoing regular physical activity regardless of level of disability. Immersion in water can enhance the treatment of neurologically impaired individuals with both therapeutic, physchological and social benefits. Hydrotherapy is the term used for exercise in warm water and is a popular treatment for patients with neurologic and musculoskeletal conditions and is defined by the Hydrotherapy Association of Chartered Physiotherapists Guidance on Good Practice in Hydrotherapy as a therapy programme using the properties of water, designed by a suitably qualified physiotherapist, to improve function, ideally in a purpose-built and suitably heated hydrotherapy pool  . Merholz et al (2011) found insufficient evidence to conclude that water based activities for people after stroke are effective for reducing disability but likewise found insufficient evidence to conclude that water-based exercises are ineffective or even harmful . A recent RCT showed positive results and a large improvement in high level balance and walking function after a 4 week hydrotherapy programme. Further research is required which need to focus on higher quand larger RCTs to evaluate the effectiveness of water-based exercises for people after stroke. Electrical stimulation may be used for those with reduced strength in their arms or legs (particularly for those with less than antigravity strength). Stretch may be applied in a number of ways during neurological rehabilitation to achieve different effects. The types of stretching used include; Fast / Quick, Prolonged and Maintained. Currently the evidence for stretching in stroke rehabilitation is weak in relation to its use in spasticity managament. Routine use of stretch to reduce spasticity is not recommended. A muscle contracture is a permanent shortening of a muscle or joint. It is usually in response to prolonged hypertonic spasticity in a concentrated muscle area. Contractures are not uncommon in limbs affected by spasticity. Contractures can impede activities such as washing or putting on clothes, and may also be uncomfortable or painful and limit the ability to sit in a wheelchair or mobilise.A Systematic Review to determine whether stretch increases joint mobility in people with existing contractures or those at risk of developing contractures provides moderate to high quality evidence that stretch, whether passive or through the means of splint or seriel casting, does not have a clinically important effect on joint mobility in people with neurological conditions. Therapy for stroke survivors with fatigue should be organised for periods of the day when they are most alert. ↑ 1.00 1.01 1.02 1.03 1.04 1.05 1.06 1.07 1.08 1.09 1.10 Veerbeek JM, van Wegen E, van Peppen R, van der Wees PJ, Hendriks E, Rietberg M, Kwakkel G. What is the evidence for physical therapy poststroke? A systematic review and meta-analysis. PloS one. 2014 Feb 4;9(2):e87987. ↑ De Jong L.D., Nieuwboer A., & Aufdemkampe, G. (2006). Contracture preventive positioning of the hemiplegic arm in subacute stroke patients: a pilot randomized controlled trial. Clinical Rehabilitation, 20: 656-667. ↑ Ada L., Goddard E., McCully J., & Bampton J. (2005). Thirty minutes of positioning reduces the development of shoulder external rotation contracture after stroke: A randomized controlled trial. Archives of Physical Medicine and Rehabilitation, 86(2): 230-34. ↑ 5.00 5.01 5.02 5.03 5.04 5.05 5.06 5.07 5.08 5.09 5.10 5.11 5.12 5.13 5.14 5.15 5.16 5.17 5.18 5.19 5.20 5.21 5.22 5.23 5.24 5.25 5.26 5.27 5.28 Stroke Foundation. DRAFT Clinical Guidelines for Stroke Management 2017. Summary of Recommendations. ↑ 6.0 6.1 Clinical Guidelines for Stroke Management A Quick Guide for Physiotherapy. National Stroke Foundation, Australia, 2010. ↑ 8.0 8.1 8.2 8.3 8.4 8.5 Veerbeek JM, van Wegen E, van Peppen R, van der Wees PJ, Hendriks E, Rietberg M, Kwakkel G. What is the evidence for physical therapy poststroke? A systematic review and meta-analysis. PloS one. 2014 Feb 4;9(2):e87987. ↑ 9.0 9.1 Cabanas-Valdes R, Cuchi GU & Bagur-Calafat C, 2013. Trunk training exercises approaches for improving trunk performance and functional sitting balance in patients with stroke: a systematic review. Neurorehabilitation, 33, 575-92. ↑ 10.0 10.1 Pollock A, Gray C, Culham E, Durward Brian R, et al, 2014a. Interventions for improving sit-to-stand ability following stroke. Cochrane Database of Systematic Reviews, CD007232. ↑ Bang DH, Cho HS. Effect of body awareness training on balance and walking ability in chronic stroke patients: a randomized controlled trial. Journal of physical therapy science. 2016;28(1):198-201. ↑ 12.0 12.1 van Duijnhoven HJ, Heeren A, Peters MA, Veerbeek JM, Kwakkel G, Geurts AC, Weerdesteyn V. Effects of Exercise Therapy on Balance Capacity in Chronic Stroke. Stroke. 2016 Oct 1;47(10):2603-10. ↑ Stanton R, Ada L, Dean CM, Preston E. Biofeedback improves activities of the lower limb after stroke: a systematic review. Journal of physiotherapy. 2011 Dec 31;57(3):145-55. ↑ Tyson SF & Kent RM, 2013. Effects of an ankle-foot orthosis on balance and walking after stroke: a systematic review and pooled meta-analysis. Archives of Physical Medicine & Rehabilitation, 94, 1377-85. ↑ English C, Hillier SL. Circuit class therapy for improving mobility after stroke. The Cochrane Library. 2010 Jan 1. ↑ 16.0 16.1 Mehrholz J, Pohl M, Elsner B. Treadmill training and body weight support for walking after stroke. The Cochrane Library. 2014 Jan 1. ↑ Corbetta D, Imeri F, Gatti R. Rehabilitation that incorporates virtual reality is more effective than standard rehabilitation for improving walking speed, balance and mobility after stroke: a systematic review. Journal of physiotherapy. 2015 Jul 31;61(3):117-24. ↑ Rodrigues-Baroni JM, Nascimento LR, Ada L, Teixeira-Salmela LF. Walking training associated with virtual reality-based training increases walking speed of individuals with chronic stroke: systematic review with meta-analysis. Brazilian journal of physical therapy. 2014 Dec;18(6):502-12. ↑ Mehrholz J, Elsner B, Werner C, Kugler J, Pohl M. Electromechanical-assisted training for walking after stroke. Stroke. 2013 Oct 1;44(10):e127-8. ↑ Nascimento LR, de Oliveira CQ, Ada L, Michaelsen SM, Teixeira-Salmela LF. Walking training with cueing of cadence improves walking speed and stride length after stroke more than walking training alone: a systematic review. Journal of physiotherapy. 2015 Jan 31;61(1):10-5. ↑ Howlett OA, Lannin NA, Ada L, McKinstry C. Functional electrical stimulation improves activity after stroke: a systematic review with meta-analysis. Archives of physical medicine and rehabilitation. 2015 May 31;96(5):934-43. ↑ 23.0 23.1 Shepherd R, Carr J. Treadmill walking in neurorehabilitation. Neurorehabilitation and Neural Repair. 1999 Sep;13(3):171-3. ↑ Mehrholz J, Pohl M. Electromechanical-assisted gait training after stroke: a systematic review comparing end-effector and exoskeleton devices. Journal of rehabilitation medicine. 2012 Mar 5;44(3):193-9. ↑ Prassas S, Thaut M, McIntosh G, Rice R. Effect of auditory rhythmic cuing on gait kinematic parameters of stroke patients. Gait & Posture. 1997 Dec 1;6(3):218-23. ↑ 26.0 26.1 26.2 Nascimento LR, de Oliveira CQ, Ada L, Michaelsen SM, Teixeira-Salmela LF. Walking training with cueing of cadence improves walking speed and stride length after stroke more than walking training alone: a systematic review. Journal of physiotherapy. 2015 Jan 31;61(1):10-5. ↑ Barclay RE, Stevenson TJ, Poluha W, Ripat J, Nett C, Srikesavan CS. Interventions for improving community ambulation in individuals with stroke. The Cochrane Library. 2015 Jan 1. ↑ Tyson SF, Kent RM. The effect of upper limb orthotics after stroke: a systematic review. NeuroRehabilitation. 2011 Jan 1;28(1):29-36. ↑ Momosaki R, Abo M, Watanabe S, Kakuda W, Yamada N, Kinoshita S. effects of ankle–foot orthoses on functional recovery after stroke: a propensity score analysis based on Japan rehabilitation database. PloS one. 2015 Apr 2;10(4):e0122688. ↑ Van Delden AE, Peper CE, Beek PJ, Kwakkel G. Unilateral versus bilateral upper limb exercise therapy after stroke: a systematic review. Journal of rehabilitation medicine. 2012 Feb 5;44(2):106-17. ↑ Coupar F, Pollock A, Van Wijck F, Morris J, Langhorne P. Simultaneous bilateral training for improving arm function after stroke. The Cochrane Library. 2010 Apr 14. ↑ Corbetta D, Sirtori V, Castellini G, Moja L, Gatti R. Constraint‐induced movement therapy for upper extremities in people with stroke. The Cochrane Library. 2015. ↑ Wee SK, Hughes AM, Warner M, Burridge JH. Trunk restraint to promote upper extremity recovery in stroke patients: a systematic review and meta-analysis. Neurorehabilitation and neural repair. 2014 Sep;28(7):660-77. ↑ Mehrholz J, Pohl M, Platz T, Kugler J, Elsner B. Electromechanical and robot‐assisted arm training for improving activities of daily living, arm function, and arm muscle strength after stroke. The Cochrane Library. 2015. ↑ Laver K, George S, Thomas S, Deutsch JE, Crotty M. Virtual reality for stroke rehabilitation. Stroke. 2012 Feb 1;43(2):e20-1. ↑ Thieme H, Mehrholz J, Pohl M, Behrens J, Dohle C. Mirror therapy for improving motor function after stroke. Stroke. 2013 Jan 1;44(1):e1-2. ↑ Liu H, Song LP, Zhang T. Mental practice combined with physical practice to enhance hand recovery in stroke patients. Behavioural neurology. 2014 Nov 9;2014. ↑ Braun SM, Beurskens AJ, Borm PJ, Schack T, Wade DT. The effects of mental practice in stroke rehabilitation: a systematic review. Archives of physical medicine and rehabilitation. 2006 Jun 30;87(6):842-52. ↑ Page SJ, Peters H. Mental practice: applying motor PRACTICE and neuroplasticity principles to increase upper extremity function. Stroke. 2014;45(11):3454-60. ↑ van de Port IG, Wevers LE, Lindeman E, Kwakkel G. Effects of circuit training as alternative to usual physiotherapy after stroke: randomised controlled trial. Bmj. 2012 May 10;344:e2672. ↑ Mehrholz J, Kugler J, Pohl M. Water‐based exercises for improving activities of daily living after stroke. The Cochrane Library. 2011 Jan 1. ↑ Zhu Z, Cui L, Yin M, Yu Y, Zhou X, Wang H, Yan H. Hydrotherapy vs. conventional land-based exercise for improving walking and balance after stroke: a randomized controlled trial. Clinical rehabilitation. 2016 Jun 1;30(6):587-93. ↑ Vafadar AK, Côté JN, Archambault PS. Effectiveness of functional electrical stimulation in improving clinical outcomes in the upper arm following stroke: a systematic review and meta-analysis. BioMed research international. 2015 Jan 22;2015. ↑ Turner-Stokes L, Fheodoroff K, Jacinto J & Maisonobe P, 2013. Results from the Upper Limb International Spasticity Study-II (ULIS-II): A large, international, prospective cohort study investigating practice and goal attainment following treatment with botulinum toxin a in real-life clinical management. BMJ Open, 3. ↑ Katalinic OM, Harvey LA, Herbert RD, Moseley AM, Lannin NA, Schurr K. Stretch for the treatment and prevention of contractures. The Cochrane Library. 2010 Sep 8. ↑ Wu S, Kutlubaev Mansur A, Chun Ho-Yan Y, Cowey E, et al, 2015. Interventions for post-stroke fatigue. Cochrane Database of Systematic Reviews, CD007030.